Our pet's ear is very sensitive, more than often, pet's owner is afraid to clean the ears due to possibility of injuring the pet's ear drum and lead to infecting the ear canal. The days of worries is over! Cluve Buds is specially designed for your pet's ear. It is designed with an objective for perfectly cleansing the ear from ear wax and preventing from hurting the ear drum while cleaning. Made with 100% anti-microbial technology, ensure a clean and anti infection cleaning each time. Clean your pet's ear with CLUVE EAR CLEANER for a perfect ear hygiene care. Containing a unique patent pending formula, that consists of 2 different biocides, it is proven to kill 99.999% of all known micro-organisms including MRSA and avian H5N1 virus. Unlike other powerful biocides, the formula is hand safe. Application: Pour in Cluve ear cleaner into your pet's ear, massage the ears and clean it dry with Cluve buds. If ears are very dirty, repeat the above steps, and clean it till all ear wax is cleaned. Disinfectant 603 quickly and easily kill viruses and bacteria on environmental surfaces in a home or public place. Disinfectant 603 with Natural Tea Tree oil is specifically designed to eliminate odor causing bacteria and leave a home smelling fresh and clean. In addition, disinfectant 603 spray kills and prevents the growth of mold and mildew on pet's bedding, kennel, pet's cage, home furniture, shoes cabinet, carpets and car's seats . It kill 99.9999% of viruses and bacteria upon contact with commonly touched hard, non-porous surfaces in a home or office. Application: Mist lightly onto affected area. For severe pet odors, pull solution and inject into odor sources with syringe. SkyBio® - patented Japan ingredient for fast action as Bactericidal, Virucidal, Tuberculocidal, Fungicidal. DEEP CLEANSING - removes oil, grease, dirt, grimes and stains. Disinfectant 603 is formulated with AD Nano , a USDA authorized A-I for use in food processing areas, compliance to OSHA 29-CFR CH. XVII 1910.1200; OSHA 40 CFRCH. I SUB PARTS C & D. Disinfectant 603 does not contain VOC’s per EPA testing protocols 8081 and 8082. AD Nano has been tested by Bolin Labs/Legend Technical Services and has passes as a non-toxic in aquatic environment by US EPA protocols as performed by Aquatic Consulting & Testing, Inc. It is safe for human and animalin its application. The classic of alcohol-based hand disinfection. Successful for over 50 years. The favorite of millions of users around the world thanks to its reliable antimicrobial activity and special skin friendliness. 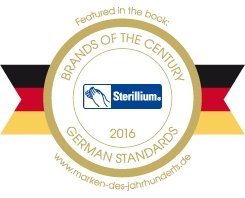 Sterillium is suitable for hygienic and surgical rub-in hand disinfection. Sterillium is used as ready-to-use alcohol-based rub-in product – independently of water and wash-basin – to prevent infection in all areas of health care and industry where hygiene is important as well as in home dialysis and when travelling.